soybean protein food processing line takes soybean and peanuts as main raw materials .after milling ,mixing ,tempering ,high-temperature ,high -pressure ,high-cutting ,then the spherical protein molecules change into chains and becomes layer fiber structure .It is smililar with the muscle state of animal and without the smell of beans . 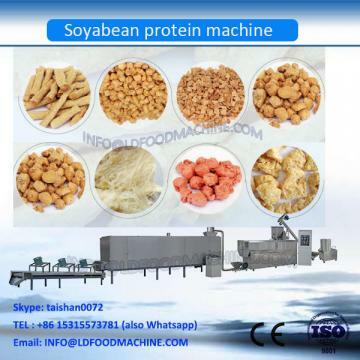 Jinan Lerun machinery equipment co.,ltd is located in Jinan TSP soya nuggets meat making equipment with gorgeous environment ,massive excellent talents and a strong atmosphere for scientific research . since its establishment ,lerun has converged many experienced expert teams majoring in food machinery industry ,andd kept its pace closely with international forefront .with great devotion to the research of extruded and expanded foods technology ,the application field of screw extrusion technology has been widened dramatically .our single /double screw extrusion technology has been applied in many fields like :TSP soya nuggets meat making equipment ,breakfast cereal ,corn flakes ,pet food ,aquatic feed ,artifical nutrition rice ,fried puffing food and biological material etc .we keep providing High -quality service for companies in Asia ,Africa and latin america and have established partnership with them .we also hope to offer better services for you in the near future .